Missouri Gov. Jay Nixon recently announced Woodland Early Learning Community School will get a major new state grant to help it develop as an early learning center. Woodland, which had been closed for several years, reopened this fall to serve Head Start children. Other organizations are looking to co-locate in the school, which is located just east of the Samuel U. Rodgers Health Center. LINC has a full-time site coordinator at the school to help develop community services and also meet the needs of the families and neighborhoods. There are plans to use the second floor of the school for the Mo. Family Support Division, Mo. Children's Division, LINC and other community-based organizations. Kansas City Public Schools submitted the top-ranked grant application for the Missouri Smart Start Initiative and will receive $480,000 to help renovate the school, which was built in the 1920s. Woodland is expected to serve 320 children (ages 3 to 4) by its second full year of operation. Nixon also announced $1 million in state tax credits for Emmanuel Family and Child Development Center -- a $4.2 million project that is a partnership between the school district and Swope Community Builders. 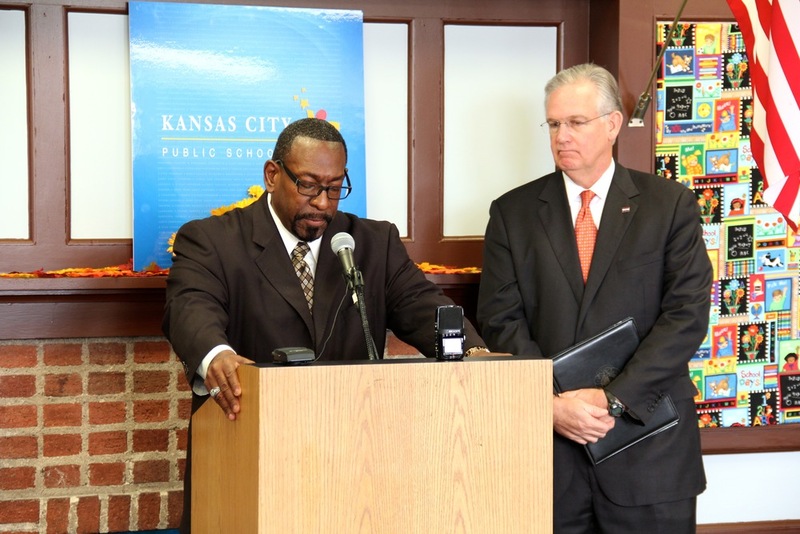 Kansas City Public School Supt. R. Stephen Green and Gov. Jay Nixon. That project will consolidate four different programs into a single 28,000 square-foot early childhood education facility. The Kansas City Public Schools board is focusing substantial attention and effort on developing early childhood programs in the school district. The board recently received a full report from a citizens commission it appointed.